In today’s content-driven world, keeping up with content creation can be a significant challenge for any organization with a small marketing staff. Who are we kidding...it can be just as challenging for larger marketing teams. So, how does a marketing team keep up? Well, many times, they turn to freelancers. When managed well, freelance writers and graphic designers are able to fill the gaps and provide high quality content. When managed poorly, the gaps are left unfilled, money is wasted and everyone leaves frustrated. For more than 15 years, part of my role has been to find and manage freelance writers and graphic designers. My role at Imagine also includes this responsibility. Over the years, I’ve learned a few things about working with them, managing the process and getting the best results. Here are five tips to help you get started. Before we begin working with any freelancer, we try to get to know them through their past work and references. We evaluate what they’ve done to date and many times give them a practice assignment. In turn, we want them to get to know us (or our client) too. I usually start with personas. Understanding who they are writing or designing for can go a long way to forming a successful relationship. If they’ll be writing for us, I share our personas. If it is one of our clients, I start with their personas. It is equally important for the freelancer to understand what exactly it is the company they are writing for does. Most have spent time on our website before speaking with us but I find it is always beneficial to talk with them and let them ask questions. This clears up any confusion before we even get started. If the writer or designer will be providing services for one of our clients, I arrange a meeting with that client. This gives the freelancer a chance to hear things from the client’s point of view and to ask questions. It helps them develop a relationship and comfort level with each other, which in the end leads to better content. I also share existing content to give them an idea of the types of content we create and how we do it. I may also share examples of content that was done well by competitors or others. This helps establish expectations. Before the first real assignment begins, it is important to establish a framework for how the relationship will work. For example, how will requests for services be made? Will the freelancer be paid by the hour or by the project? How many drafts will be produced? 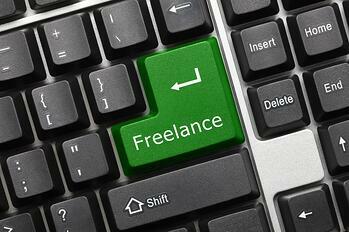 How should the freelancer provide invoices? Clearly defining the basics before any project begins will reduce the chances for confusion in the future. It also allows the freelancer to focus on the projects instead of the administrative tasks involved. Before a writer or designer can begin, they need to know certain things. Spending time answering these questions thoroughly can eliminate the need for additional drafts and time spent later in the process. What is the desired end product? A case study, a whitepaper, an ebook? What is the main message the writer or designer should convey? Are there any specific points that should be made? Which of your personas does the piece target? What resources are available to help them? What is the timeline/deadline for production? Some projects require more details than others. For example, we are currently working with one of our freelancers on an ebook. We had a very specific idea of what topics should be covered and in what order. We met with the writer to discuss the piece and allow her to ask questions. From there, we provided several resources and a very detailed outline. She was able to write the text with little additional guidance and on an aggressive schedule. As drafts are created, it is important to provide feedback to the writer or artist. It helps them learn about you (or your client they’re writing for) and your expectations. Clear, honest feedback will improve the process from beginning to end. Successful freelancers always ask for feedback. If you’re working with someone who isn’t, it may be time to move on. For this relationship to work, clear communication is key and has been implied in the other four tips. Everything from rates to invoices to intent to feedback requires clear communication. Asking questions of each other and spending time clarifying information will lead to better relationships between all parties. I enjoy working with freelancers. They bring a fresh perspective to our projects and for our clients’ projects. They also allow us to do more with less. Spend the time to create meaningful relationships with freelancers. It will be a win-win.